The recent introduction of traded options on crude oil futures contracts at the New York Mercantile Exchange (NYMEX) gives energy economists a new tool for forecasting the price of crude oil. Since the pricing of these options requires that market participants assess the probability distribution of future crude oil prices, a properly specified model of option pricing can be used to "back out" this assessment from observed option prices. 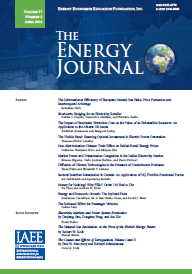 Published in Volume 9, Number 4 of The Quarterly Journal of the IAEE's Energy Economics Education Foundation.